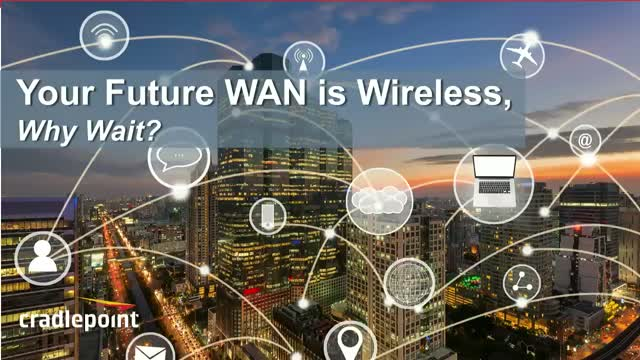 Your Future WAN is Wireless, Why Wait? In 1997, the world was introduced to 802.11 “WiFi” and within a couple of years, it became a business networking staple. At the time, few would have foreseen that WiFi would become the dominant way we connect at home, work, and play today. As more of what businesses connect to is in the cloud, and more of what they are connecting is outside the office, 4G LTE is quickly becoming the next wireless revolution for connecting people, places, and things. This time, the revolution is in the WAN. Just like the evolution of the 802.11 WiFi standard, which is on the cusp of 802.11ax, the world of LTE has evolved significantly since it was first deployed less than a decade ago. Today, cellular providers are already rolling out Gigabit LTE with plans to launch 5G in several other U.S. cities mid-year. Any business contemplating a refresh of their WAN in support of cloud and digital transformation initiatives needs to be thinking about the role of 4G LTE and 5G services. If history is our guide, your future WAN will be wireless. Cradlepoint is an industry leader in edge solutions for 4G LTE and 5G enabled networks. With the help of Spiceworks, Cradlepoint conducted a survey of over a hundred enterprise IT decision-makers in North America to assess the pervasiveness of 4G LTE within enterprise WANs today and uncover some misconceptions. Join Todd Krautkremer, CMO at Cradlepoint, for a live webinar on April 19th, 2018 at 9:00 am PT to learn about how organizations are leveraging 4G LTE within the enterprise, WANs today, and the role advanced 4G and 5G wireless services will play in next-gen, software-defined WAN strategies. Title: Your Future WAN is Wireless, Why Wait?